This begins a weekly review at Ornament Studio. Here, we will assemble thoughts and photos from the previous week’s Facebook posts to highlight to moods and the progression of seasons at the workbench. The ebb and flow of rivers greatly contributes to the movement of rocks and sediments. Our Vermont Serpentine is generally found on river banks. We look forward to spring (already!) as rushing waters will unearth new specimens. Fresh off the grinding wheel… Lamoille County, Vermont, serpentine on 22K gold hoop earrings. Green is considered a “cold” color, and gold is “warm,” yet they do not contrast, but play together in perfect harmony. Here was one of the most popular articles on this Blog last week: Vermont Serpentine – Stone To Gem. 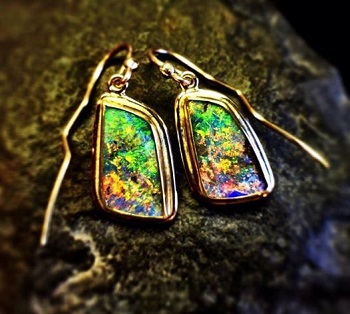 Australian boulder opals and gold earrings – Boulder opals are found exclusively in the state of Queensland, Australia. They are mined from ironstone boulders, underground. They form in thin fissures in the iron boulders. For this reason, most cuts usually include a thin layer of the ironstone on the back of the gem. This preserves its integrity and allows for the maximum area of the colorful gem to show. From the archives. 14K gold and diamond. Virtually any jewelry is recyclable, in part or in whole. Gold can be melted and reshaped; gems nestled in new settings. Stones in ring can become accents in pendants or bracelets. It’s all up to the imagination to see something new. Recycled silver and gold. Hammered silver speaks the language of the rippling river. It is discreet. It whispers. Its message is different for everyone, but it always speaks of gentleness and perhaps of the importance of perseverance.